I hope you all had a great weekend. It was a bit overcast and rainy here but that meant I spent a bit of time in the studio crafting and we also finished watching season three of Broadchurch. Have you guys seen that? I loved it and am just bummed out there won’t be another season. So as Christmas is coming up (which I still can’t believe it’s almost here) I decided to do a quick stop at the library to drop off some books that were due soon and which I didn’t get to finish. Rats. Of course I had to pick up a few as the library is going to be closed for the holiday. I may have hundreds of TBR books but that doesn’t stop me from acting like I’m going to run out of reading material while the library is closed. Ha. 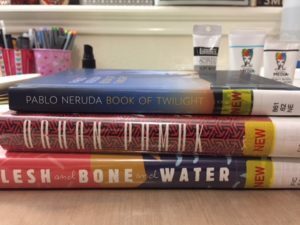 I borrowed Book of Twilight by Pablo Neruda, The Red-Haired Woman by Orhan Pamuk and Flesh and Bone and Water by Luiza Sauma. These all sounds wonderful but I can tell you I’m probably going to pick up the Neruda book first. So I know that with the year drawing to a close we are all putting lists of best/favorite books and I’ve started working on mine. I’m hopeful I’ll still finish three books before end of the year so expect the list next week. I’m still trying to do some mini reviews and decide on reading challenges. Oh my goodness, I know I don’t have a very good track record with reading challenges but there are some favorites I want to keep doing and I’ve heard of some others that are just too good to pass up so a post on those coming up soon as well. Anyway, hope you all have a great start to the week and let me know you are still working on your end of year favorites list and/or are going to do any reading challenges. I still haven’t work on my favourites list yet. I’ve a few books I haven’t finish and I’m hoping they’ll add on to my 2017 reads and who knows if these books will add on to my favourites list, ha. We shall see. So many of the books I’ve read this year were ARCs scheduled for 2018, so my reviews haven’t posted yet. –will have to go over all of those to decide on my list. Neruda — sounds good! I realize I haven’t read any of his work since college, and it probably would be wise to return to pick up something I missed earlier. I would love to finish up a few more books before the end of the year as well. I have all next week off so it might happen if I can find the time among all of the other things that I would like to get done 🙂 I need to start thinking about my top reads list as well soon. I hope you have a wonderful upcoming holiday Iliana! I have done such a poor job of keeping track of my books this year I am going to have to spend a lot of time just reconstructing my reading! But that’s ok. I look forward to finding out what your favorites were! I’ve only reviewed ONE book for 2017 (busy posting for books read in 2016, as well as posts about our travels and weekend cooking), but I should be able to put together my list of favorites fairly quickly since my numbers are way down this year. I love reading everyone else’s summaries for the year and I’m sure I’ll add quite a few titles to my Goodreads’ list.